Earn up to 50% from all sales through your affiliate links! 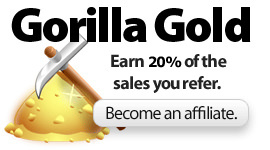 When you sign up and become our a Gorilla Themes affiliate, you can place the banners and code in your website or blog and every time somebody clicks on the ad in your website and buys a theme from our store you’ll get paid up to 50% of the price the theme was sold. You’ll receive an email each time that you earn a commission and you can login into your affiliate area to track coupons, campaigns and more. It’s very simple and easy to earn some extra money! Gorilla Themes require a valid PayPal account to process the payments. Reversed payments, chargebacks and non-completed transactions on themes will not be paid out and we can provide information (Screenshot) of the incident by request. Affiliates cannot refer themselves to purchase any theme from the store and commissions will not be paid for this type of transactions and can be subject of the affiliate account removal.